Stephen King tends to be one of the biggest cheerleaders for adaptations of his own work. People who follow him on Twitter know that they can always count on him to post trailers or send out reminders when new episodes of 11/22/63 are available, but one of his recent tweets about director Nikolaj Arcel’s adaptation of his Dark Tower books goes a lot further than just saying how excited he is for it. In fact, it might even be a really big twist for how the movie is going to handle the original story’s surprise ending—the real ending, that is. The ending that King prefaced with a warning about how readers probably wouldn’t like it. Obviously, then, saying anything else is a big spoiler, so this is your final warning. 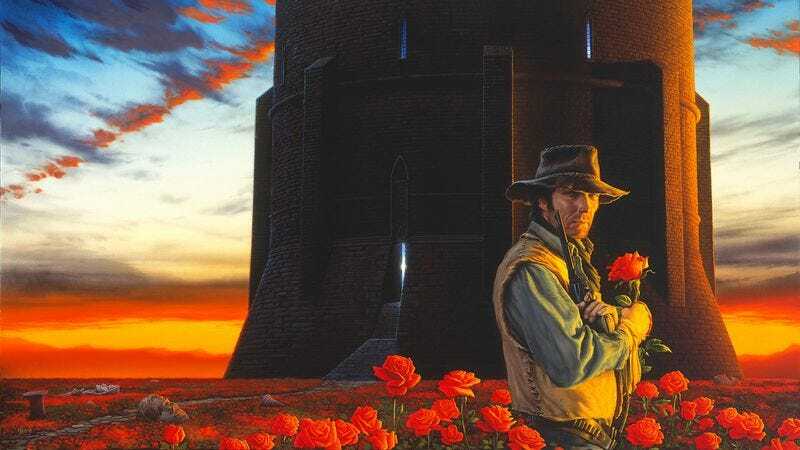 The Dark Tower saga centers around a guy named Roland who is on a quest to reach the eponymous tower and stop a villain called the Crimson King from using it to destroy all of reality. When he gets there, he’s supposed to triumphantly blow the Horn Of Eld, an object that has been passed down through his family for generations. However, when the reader meets Roland in the first book, he has long since lost the horn. Therefore, he’s unable to blow it when he reaches the Dark Tower, so when he tries to finally finish his seven-book adventure by entering the room at the top, he—last warning—gets sucked back into the very beginning of the first book and loses all of his memories. King is vague about why exactly this happens, but the assumption is that Roland didn’t finish his quest “properly,” so he has to do it again until he gets it right. Tellingly, though, Roland has the horn when he starts his quest anew, suggesting that his next attempt will really be his last. There’s an image of the Horn Of Eld, the words “Last Time Around,” and it’s hard to interpret King’s caption as being anything but a reference to Roland actually blowing the horn like he’s supposed to. If that’s the case, and Idris Elba’s Roland is really being set up to get things right in the movie that the character got wrong in the book, then it has huge implications for the film’s plot. For one thing, it means the movie might technically be a sequel to the books and not just a re-telling of the same story, and this could be a way of justifying any changes that the movie makes. After all, it wouldn’t be telling the same story, it would be telling a purposefully different version of that story. Plus, that’s all without even mentioning that this movie (or a hypothetical sequel) could give the entire saga the truly definitive ending that it never had before, which means—possibly for the first time ever—this could be an adaptation that actually impacts the books it’s based on. It is, in a word, bananas.